I've read a few hunting-for-grandparent books over the years, beginning with Brendan Buckley's Universe and Everything in It by Sundee Frazier. 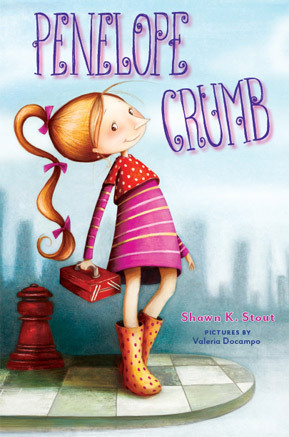 I believe Penelope Crumb by Shawn K. Stout is the fourth. Years ago, some blogging buddy made a joke about three books meaning you had a new genre on your hands. The other three books all involved children of mixed race, and the search for a grandparent involved identity. Penelope Crumb is a white child, and her search for her grandfather involves identity, too. Her father died before her birth, and she's never known his father. She becomes interested when she notices something about her appearance. She has a big nose. When her mother tells her she looks like the grandfather she's never known, she decides to hunt him down. Penelope has a strong, well-defined personality. The book is written with subtlety and wit, particularly when you consider that it is marketed to students in the lower grades. Subtlety and wit are not often seen in books written for those kids. What do I mean by subtlety? Penelope is a first-person narrator who has a host of complaints about her older brother. Even so, we readers can see that the Alien has moments of almost caring for his little sister. The nose. Penelope actually has a big nose, it's not just something she's concerned about as happens in many children's books. She's reasonably concerned about it, but at the same time, takes it in stride. Of course, she's in fourth grade, not eighth. Graveyard Dead. Penelope often refers to people who are "Graveyard Dead" versus, say, people you might think are dead (like her grandfather) but aren't. Her father, for instance, is Graveyard Dead. Her father being Graveyard Dead doesn't distress her. It's more a fact of life. Little Darling. Penelope is a well-loved child. Nonetheless, she has fantasies of loved ones saying things to her like, "Oh, little darling. Oh, my heart." It's a fantasy that comes true. Definitely my favorite hunting-for-grandparent book. With illustrations by Valeria Docampo.